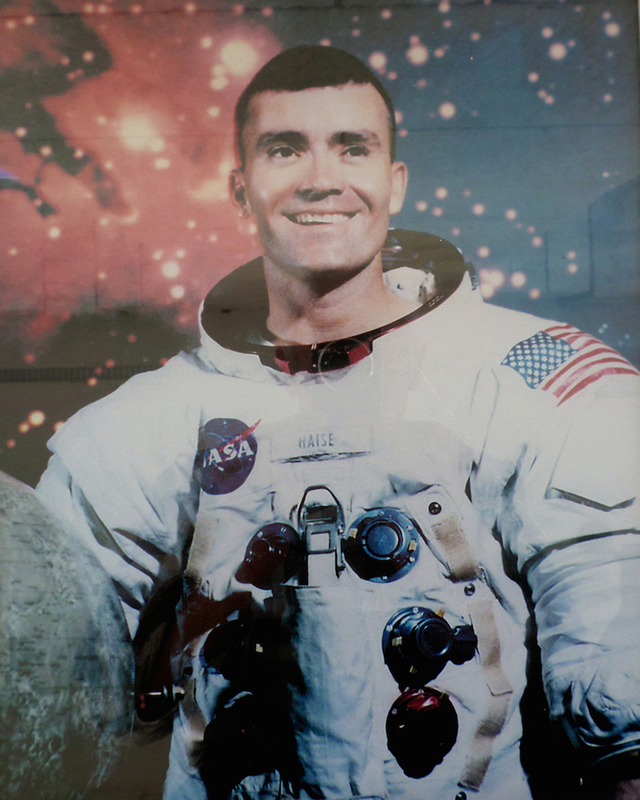 Astronaut Fred Wallace Haise Jr. was born in Biloxi, Mississippi, on 14 November 1933. He attended Biloxi public schools and graduated from Biloxi High School before earning an associate’s degree from Perkinston Junior College. He then joined the naval aviation cadet program and became a fighter pilot with the US Marines between 1954 and 1956. He subsequently returned to school, receiving a bachelor of science degree in aeronautical engineering from the University of Oklahoma in 1959. During his military career, Haise had served as a research pilot for the National Aeronautics and Space Agency (NASA), and in April 1966 he was among nineteen pilots selected as part of NASA’s Astronaut Group 5. He served as a backup pilot for the Apollo 8, 11, and 16 missions before going into space in 1970 as the lunar module pilot for the Apollo 13 mission to the moon. About fifty-five hours into the flight, a ruptured oxygen tank forced the crew to scuttle the mission. With assistance from Houston ground controllers, Haise and his fellow crew members, James A. Lovell and John L. Swigert, managed to return safely to earth. The mission was dramatized in a 1995 film, Apollo 13, in which Bill Paxton played Haise. The film was nominated for the Academy Award for Best Picture. From April 1973 to January 1976 Haise served as technical assistant to the manager of the Space Shuttle Orbiter Project. In 1977 he commanded a two-man crew that piloted space shuttle approach and landing test flights. Haise resigned from NASA in 1979 to take a position with Grumman Aerospace Corporation. He retired in 1996. Haise’s awards include the Presidential Medal of Freedom, the NASA Distinguished Service Medal, the AIAA Haley Astronautics Award, the American Astronautical Society Flight Achievement Award, and the City of New York Gold Medal.